JBG would begin demolition next spring. The Chevy Chase-based development firm would then build an attractive, two-story retail and office building along North Washington Street, which would include a new Bank of America branch. That would act as a catalyst for future phases, which could add residences, park-like settings, new road connections, street-level retail, wide sidewalks and open, public spaces. To link the Beall Avenue block to the popular Town Square next door, Greenberg said JBG will work with the City to extend Maryland Avenue north through the property, and border the street with a park area and new street-level retail. Another new road will bisect the property from east to west, creating a more pedestrian-friendly grid of streets and sidewalks. JBG plans to hire individual architects for each block it controls to deliver interesting, organic design and high-quality buildings. Master planner Cooper Carry and a renowned landscape architecture firm will take a holistic approach to the entire property to ensure it links to neighboring communities and fits within the fabric of Rockville. City leaders are anxious to revitalize the triangular-shaped block to add to the energy of Rockville Town Center, and to generate new economic and tax benefits for Rockville. Residents and businesses are anxious to learn about this project because as the first project in Town Center II, it sets the pace for the rest of the development. Some initial concerns focused on its relationship to the adjacent street (Town Square presents an unfriendly side to Washington Avenue), traffic and parking (a perennial issue and it always seems to be too much or too little), and green space, and I’ve heard recent grumbling about its height (which puzzles me because it’s a two-story building). Of course, everyone wants to know what this might mean for the rest of the block, including the property owners, who are trying to predict the future to determine if they continue as is, sell, or take a risk on redeveloping. No matter what, Town Center II will pose a challenge for the city’s environment and historic district commissions because of the potential historic landmarks (e.g., the Suburban Trust Bank and James McCord’s office) and amount of demolition debris heading to landfills (most trash in landfills is due to construction, not diapers). To learn more about this project, you can follow it online through the city’s approval process. Even better, Tony Greenberg of the JBG Companies will be speaking about it at the Thursday, December 6 meeting of the Rockville Community Coalition at 7:30 pm in Room 52 of the Unitarian-Universalist Church (100 Welsh Park Drive, tucked inside the neighborhood along Manakee Street). The meeting is open to the public and admission is free. On December 6 at the Rockville Community Coalition meeting, Tony Greenberg provided an overview of the project and answered questions at the Rockville Community Coalition meeting. He explained that the development of Town Center 2 (the section north of Town Square) is complicated by a half-dozen property owners and irregularly shaped lots. JBG owns the lot with the former Giant grocery store and has control over the lot that contains the office buildings at 414-416 Hungerford. Although downtown is not an ideal location for a fire station, it is very difficult to find an alternative location because of the need to place fire stations within a specific area to meet response times. 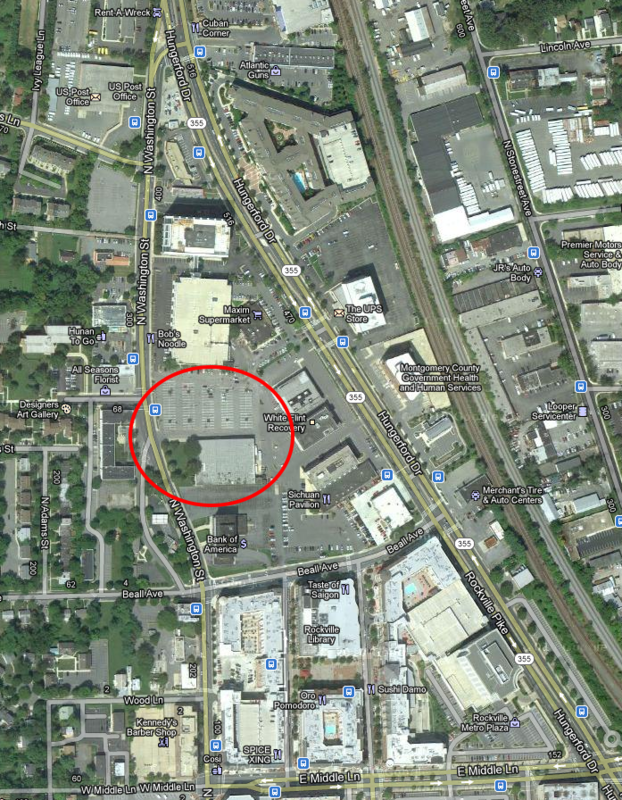 Greenberg explained that the former Giant site will be split into two parcels. The parcel fronting Washington Avenue will have a tall two-story building with the relocated Bank of America, a restaurant (to be determined), and other retail, with offices on the second floor and parking underneath. Construction on this parcel will begin in summer 2013 and be completed a year later. The building will be environmentally sensitive, but it probably won’t be LEED certified due to the additional costs of “commissioning.” The second lot is planned for luxury senior housing and will be sold to another company who has expertise in the these projects, and will require city approval. Some significant changes this project will introduce to this section of Washington Avenue is a wider sidewalk to accommodate outdoor seating for a restaurant and a wider street to accommodate curb-side parking for about six-eight cars. Among the other topics raised in the discussion was the general difficulty of redeveloping shopping centers (such as the Twinbrook Center) because increased risk due to the loss rental income on top of construction costs; that the highest density isn’t always the best because you may build more space than can be occupied (hence their decision to stay at two stories with this project although they could go much higher); the impact of the looming Fiscal Cliff on the local economy (30-40% of the region relies on federal spending); and that developers are concerned about the city’s tree ordinance and APFO. The meeting didn’t come to any conclusions or make any decisions, but it’s always a great way to hear different perspectives and consider alternative possibilities.